Cameron (Cam) Cooper came to Vanderbilt from a small liberal arts college in West Virginia, where he played football all four years. An avid sportsman and team player, he sought a post-collegiate career that emphasized teamwork and a sense of community. Public accounting’s team-based atmosphere and collaborative culture led him to consider a career with the Big Four. After exploring his options, he realized he would need the CPA credential. 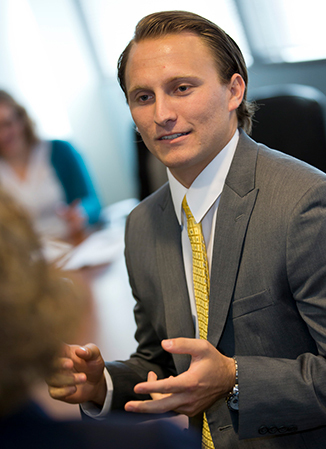 He enrolled in the Vanderbilt MAcc program and is now working with EY as an Assurance Associate in Nashville. Cam describes a typical day at work in the audit field. I wake up and start getting ready for the day. I try to be in the office early to get a jump-start on my projects. I’m at my desk and begin checking emails for anything that requires immediate attention. I also check my calendar, prep for any daily meetings and touch base with my senior associate to make sure we have a game plan for our day. We meet as a team to check in on our priorities and goals for the week. It’s important to make sure we are all on the same page and working to meet the needs of our clients. After forming our plan for the week, I start to touch base with clients. It’s important that I gather the necessary information about how certain businesses work so that we can accurately assess their projects. The entire team usually takes lunch together. We each bring our lunch and meet in the EY cafeteria. It’s a great way to get to know one another and interact with the team members in a different way. I’m back to work and making sure that I reach out to clients for any last-minute requests I have for the day. I may need a business document or a quick conversation with a key stakeholder in order to continue my work for the rest of the day. Mid-afternoon, we often have informal status meetings with our senior associates to update them on our progress and any issues that we may have. After a quick conversation, it’s back to work! I start to wrap up and make my schedule for tomorrow based on the day’s accomplishments and our team’s goals for the week. I try to work out at least three times during the workweek, so often you will find me heading to the gym or going for a run. If I have time, I may catch a music show around Nashville last-minute. One of my favorite venues is Marathon Music Works—it’s a great place to hear some of the music that has made Nashville famous. If I don’t have plans for the evening, I will head home to hang with my new black lab. Regardless of my after-work plans, I’m usually winding down around this time and getting ready for the next day.